Circus Flora is a one-ring, European styled circus based in St. Louis, Missouri, featuring acts such as The Flying Wallendas. In addition to preserving the history of the circus, each year I approach it with new photography techniques – sometimes winding up with a single Polaroid to capture the moment. I have been documenting Circus Flora since 1996. 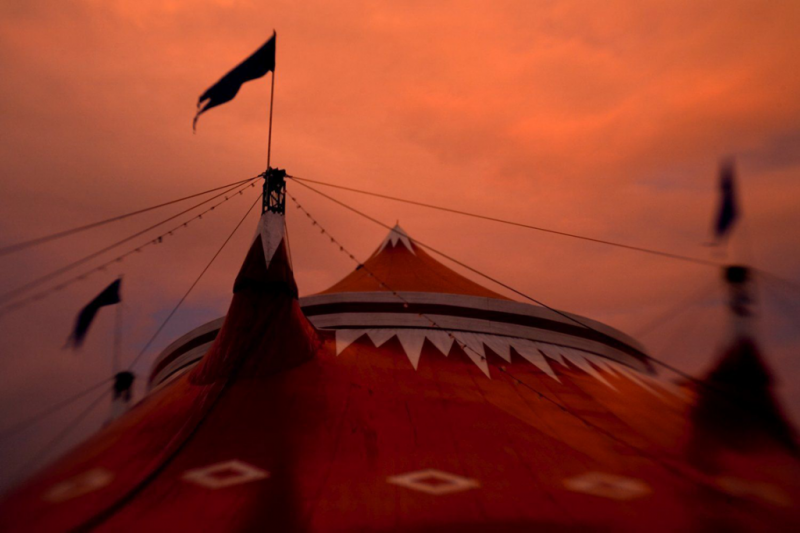 The photo of the tent was my second time photographing Circus Flora in color, taken in 2007. I grew up in a north suburb of Chicago, IL, and since the eighth grade I knew that I wanted to be a photographer. My first pictures were taken with a 110 camera, capturing dramatic close-ups of Chicago Cubs players while I was waiting for their autographs. I received my degree in photography from Southern Illinois University at Carbondale. I am currently based in Tulsa, Oklahoma. My fine art book, “Oklahoma-A Portrait Of America” was released in December, 2007. I currently have a circus book being designed featuring photographs from Circus Flora and the Zoppe Family Circus.